Welcome to the Western Watermelon Association website. We are a chapter of the National Watermelon Association. Geographically we represent all of the Watermelon producing states West of Texas, including Hawaii and the country of Mexico. Our membership is comprised of Watermelon growers, shippers, distributors, and related service providers but anyone with an interest in the Watermelon industry is encouraged to join. Our priorities are to represent the interest of our industry, the interest of our members and to lend our organizations support onto issues that affect the produce industry. The vegetable watermelon is fat free, nutritionally low in calories and considered an ideal diet food, and is high in energy. Watermelon is perhaps the most refreshing, thirst quenching fruit of all. 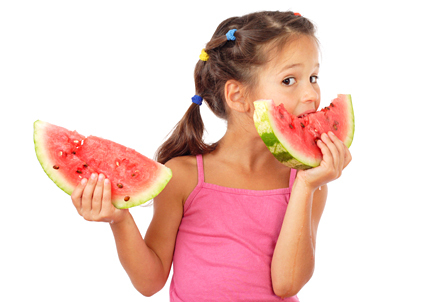 Watermelon consists of 92% water which is a great thirst quencher all year around. Watermelon is an excellent source of vitamin C, beta-carotene and lycopene as well as a good source of vitamins B1 and B6, pantothenic acid, biotin, magnesium, potassium and dietary fiber. Rich in natural source of lycopene, an antioxidant that may help reduce the risks of the of diseases related to oxidative stress. Dietary consumption of the carotenoid lycopene has been associated with a lower risk of prostate cancer. Research indicates that lycopene is helpful in reducing the risk of prostate, breast, and endometrial cancers, as well as lung and colon cancer. heart disease, and asthma. 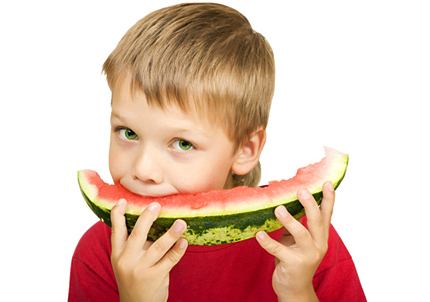 Eating watermelon can protect against the negative effects of macular degeneration. Macular degeneration is just a fancy word for loss of vision. It fights the age-related symptoms of vision loss. Studies show that eating watermelon is actually healthy for your eyes than eating carrots. As an immune system booster Watermelon is a rich source of citrulline, an amino acid that can be metabolized to arginine, an essential amino acid. A controlled human study investigated if watermelon juice consumption increases fasting concentrations of plasma arginine, ornithine, and citrulline in healthy adult humans. Puree the 4 cups of (larger cubed) watermelon, the orange juice, jalapeno, cashew butter, lime juice and zest and the Agave nectar until very smooth. Stir in the remaining watermelon, the onion, cucumber, blueberries, yellow and green peppers, tomatoes and cilantro. Season with salt and pepper and refrigerate covered for at least one hour. For more fun recipes Click here. 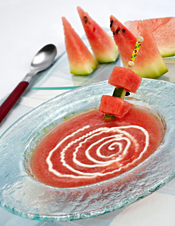 In a large bowl, combine the watermelon, feta, and a few generous grindings of black pepper. For a little more zing, add the red pepper flakes. Put lime wedges, sugar and mint leafs into a durable mixing glass. Use a muddler to crush the mint and lime until sugar is dissolved. Add watermelon and mesh until most of the juice is out! Put ice into the glass, and add rum (optional). Pour into cocktail shaker and shake vigorously. Strain mixture into a glass filled with ice. 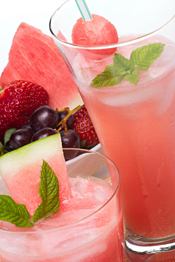 Top with club soda, garnish with a couple of mint sprigs and a small watermelon wedge and serve. We are going back to Vegas!